What would you rather spend your money on, the latest Apple product (not the fruit) or buying free-range food? Depending on your answer, you may need to rethink your attitude. Britain eats four times more ready meals than any country in Europe, and often considers buying the lowest quality food as a sign of thriftiness rather than a disregard for health. As a result of Blythman’s persuasive rhetoric, I have understood for the first time that a penchant for buying the lowest quality food is quite a British taste. Many people in this country would call it snobbish to buy free-range poultry and meat, rather than see it as a genuine concern for animal welfare and their own health. I know I did. Yet, I’ve always been bemused by our apparent decline in cooking skills amidst the fervour surrounding celebrity chefs like Jamie, Gordon and Nigella. We are a nation obsessed with food, looking at food and fetishizing it, trying not to eat it and failing miserably, but disinclined when it comes to actually cooking it. Swamped by exotic ingredients and gourmet recipes parading across our TV screens, we feel overwhelmed by these artisan methods and become increasingly scared to cook in our own modernised, glittering chrome kitchens. This is part of the problem. Celebrity cooking culture belies our nation’s true cooking habits, when in reality regular people are less able to cook than they were fifty years ago. This is because cooking skills are primarily passed down from parent to child, whereas now ready meals are making it increasingly unnecessary to know how to cook. Cooking lessons in schools focus less on practical skills than they do on the factory food production method. This is one of many reasons why we have become out of touch with our food. Children come to feel comfortable with processed food in brightly coloured packets, not really resembling anything that has been plucked from the earth. When I was younger, I could barely be persuaded to eat anything other than instant noodles. The visceral appearance of meat in particular had me nauseous. This disenchantment with food is partly what leads us to demand increasingly cheaper products with no regard to the sacrifice in quality. To keep up with a growing demand for economy food, companies have been using intensive farming methods to rear the most livestock with the least overheads. Everyone has seen the images and footage of the chickens crammed in cages with no room to move, their beaks cut off to prevent their cannibalising one another. Despite this horror, we are increasingly removed from the agony of these farming methods, with a small pang of horror whenever we happen across an exposé document that is quickly forgotten when the scent of the next Big Mac reaches us on the wind. However, this is not the right attitude. Blythman rightly made me see food as the fuel we put in to our bodies, to replenish our faculties and reproduce those cells. The negative effect on the body is all too evident after a few days of bingeing on takeaways and other fatty, salty processed foods. Cooking from scratch is by far the best way to make sure you get off on the right foot to deal with life’s hurdles. Is it a case of “happy” chickens versus mad, beakless cannibal hens? Maybe. She made me see that you don’t need to have vegetarian or upper middle-class leanings to want the best from your food. For the first time in my life I bought free-range eggs. Psychologically, I imagined them to be better, but really an egg is an egg. What I do know is that I don’t need to stave off nightmarish images of beakless, featherless chickens squawking miserably in ferociously packed cages whilst I am tucking into an omelette. I can enjoy my shamelessly carnivorous meals without trying not to imagine the cruel and, I argue, inhuman treatment of animals in pursuit of unsustainably high yields. Factory farms use up huge amounts of water, energy, and chemicals, often with little regard to long-term adverse effects, much more so than the equivalent number of low-intensity farms. Chemical fertilizers and other toxic substances used to control the disease that is rife in such cramped conditions are polluting the surrounding environment, killing off the eco-system. Such farms also put many small and local producers out of business because they cannot compete with the higher yields and lower prices of more intensive farming methods. The average age of a worker in the agricultural industry is 50, and over half of these are 55. This means we rely increasingly on a small number of suppliers for our national food consumption, as well as produce imported vast distances from other countries. These suppliers are often big-name supermarkets such as Tesco, Sainsbury’s and Asda. An oligopoly is not good for the economy, and such intensive use of resources is not sustainable. Adopting a national diet of higher welfare products would not only benefit the economy and the environment, but it also means that we will be healthier. Free range, organic chicken has up to 50% less fat than its caged counterpart. 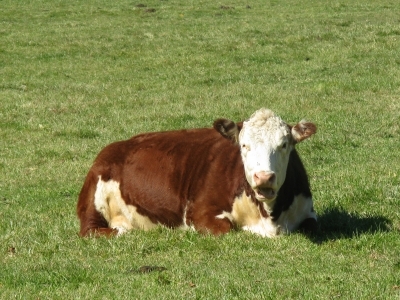 Pasture-reared beef has 25-50% less fat than cows reared in confinement. All higher welfare meat and eggs contain significantly increased levels of essential omega-3 fatty acids and anti-oxidants. All of these reasons (and more) are why I have changed my ways permanently and try to buy the highest quality meat, eggs and and dairy I can afford. I have learned that food is not an area to try and save money, and would rather go without a new item of clothing or a few drinks at the pub if it means my body benefits in the long run. I would rather be drooling over the myriad recipes it is possible to cook with a basic range of culinary skills and higher welfare products, than being scared witless by celebrity chef programs and put off by low-grade food. Becoming enchanted with the colours and shapes and taste of food is essential for getting the most out of life.